If only massive timbers snapped into place like Legos. We’re speaking over the thwacks of a sledge hammer that a carpenter on a portable lift is swinging to woo the enormous beam into a sturdy steel bracket. The image of mass timber puts it in a slightly softer place than the steel girders. This is wood, after all — that smooth, natural material that you can run your hands across to feel at one with the Earth. From an environmental perspective, the big difference is that wood is a renewable resource: It stores carbon, unlike steel or cement, which require tons of carbon emissions to manufacturer. 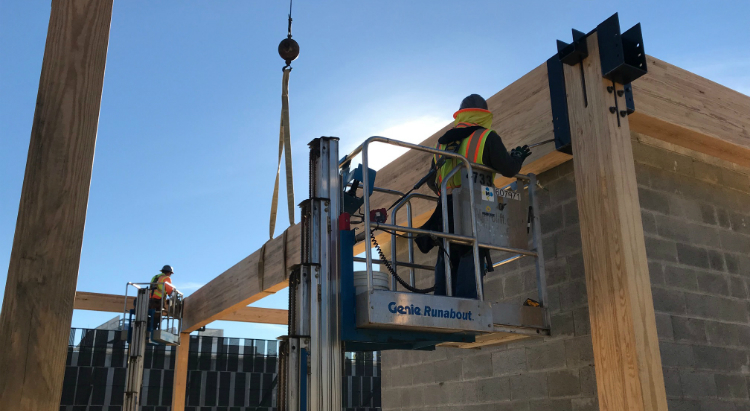 But, when you get right down to it, mass timber construction is pretty robust business — just not quite as heavy a lift as assembling the steel I-beams or pouring the tons of concrete that form the skeletons of most large commercial buildings. 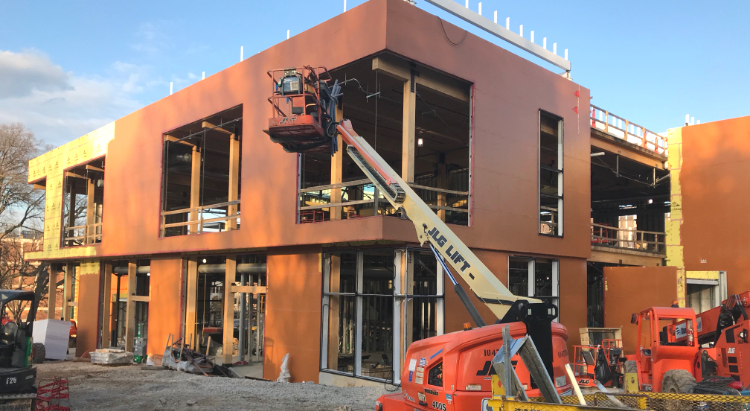 Contractor Skanska USA selected Universal Timber Structures out of Auburndale, Fla., to piece together the more than 200 glue-laminated posts and beams that form the structure of the building as well as to install nearly 500 nail-laminated panels that form much of the floor system. “This isn’t really such a complicated job,” says Febronio “Junior” Trevino, superintendent for a dozen Universal Timber employees onsite. In 27 years of timber construction, Trevino figures he’s worked 1,000 jobs. The difficult ones have ranged from curvaceous church sanctuaries to great halls replete with custom trusses and lattice work. The Kendeda Building is a relatively large project saddled with the exacting materials requirements of the Living Building Challenge. 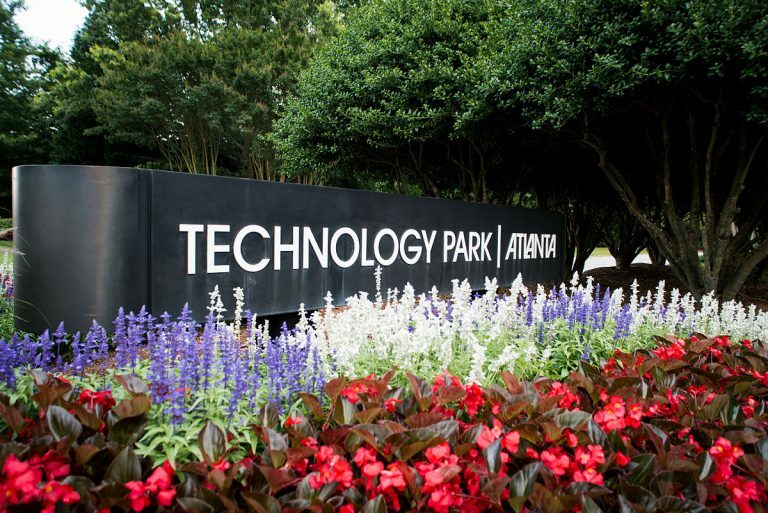 But the structural design by Atlanta-based Uzun+Case is pretty straightforward. It calls for glue-laminated vertical columns and glue-laminated horizontal beams to be installed at 90-degree angles. It was Lord Aeck Sargent architect Joshua Gassman who proposed the 10-foot-by-six-foot nail-laminated floor panels, but Uzon+Case had to approve the that his idea — to create the panels out of on-edge two-by-sixes and salvaged two-by-fours — would hold up structurally. One slight deviation from all those neatly parallel and perpendicular wood elements is that on some of the longer spans, the glulam beams must be supplemented by steel “queen trusses” that bolster the beams’ strength but allow them to be shallower than would otherwise be necessary. 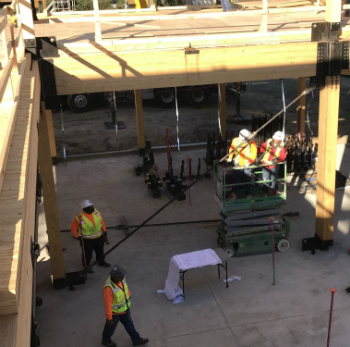 But the beams, posts, floor panels and steel bracing are all fairly straightforward to install, says Trevino as we watch two workers install another beam on the second floor. The trick lies in getting certain details right. He explains that two men on our left are using a large strap and winch to squeeze a tiny gap between the beam and one of the posts. This is before bolting them in place through the heavy steel brackets. The most complicated part of the job may have come well before construction — during material selection and vetting. 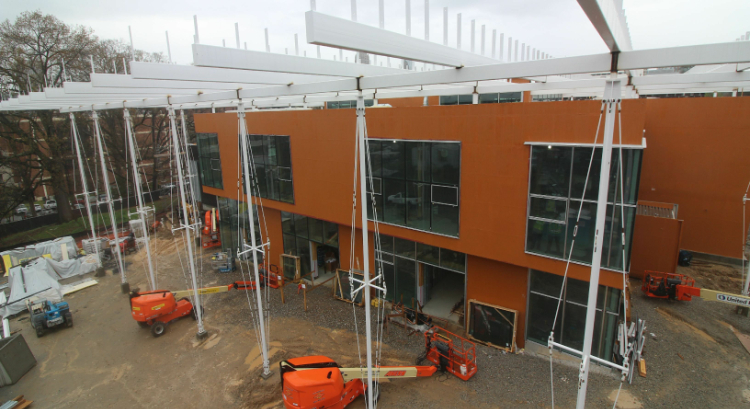 Architects at Lord Aeck Sargent, as well as personnel at Skanska, had to ensure that the wood, the glue used to hold the wood together, the coatings for the glulams and the steel parts all met the exacting requirements of the LBC Materials Petal. For example, all the materials had to be free of toxic materials on the International Living Future Institute “Red List.” They also had to source Forest Stewardship Council certified wood within 500 kilometers of the site, which isn’t easy in the Southeast — where the trees from many FSC forests are reserved for paper use. After being pieced together, the from lamstock dimensional lumber, the glulams were shipped to Universal Timber’s shop in Auburndale, Fla., where they were trimmed and bored for final installation. And finally, in mid-September, Trevino and his crew arrived at the construction site — ready to take delivery of the massive glulams as well as the nail-laminated decking. When it comes to the actual construction phase, wood holds several advantages over steel. One of those advantages is speed. 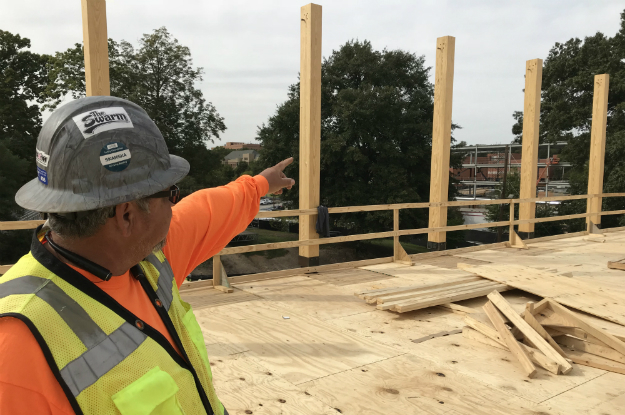 From the second floor of the Kendeda Building, Junior points out a few differences between structural timber and steel construction. Photo by Ken Edelstein. “The actual erection happens pretty quickly since you’re working in prefabricated panelized floor sections and pre-cut pieces of lumber,” says Uzun+Case’s Jones. It also helps that lumber is much lighter than steel. Universal Timber doesn’t need as heavy a crane or as large a crew as a steel construction team might to manipulate their posts and beams. The worksite takes on a bit more of a craftsman’s atmosphere. 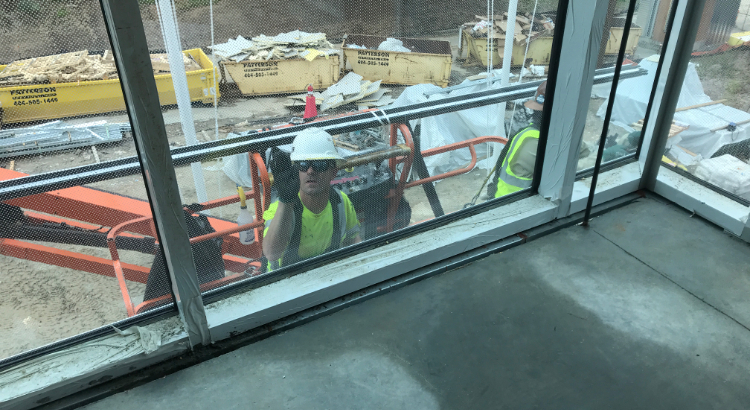 Trevino points this out as we look from the second floor to a nearby site at a similar phase of construction, except that building is being framed with steel girders. His trade he points out — with some pride — is carpentry. PHOTO AT TOP: Two Universal Timber Structures secure carpenters secure a 36-foot beam on the second floor of the Kendeda Building. Photo by Ken Edelstein.